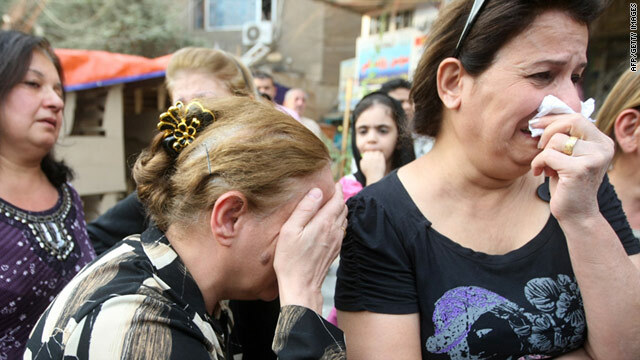 Many of Iraq's Christian minority have been forced to flee the country amid increasing violence against them. (CNN) -- Violence in recent weeks has prompted a "slow but steady exodus" of Christians from the Iraqi cities of Baghdad and Mosul, the U.N. refugee agency said on Friday. The trend started after a Baghdad church attack on October 31 and subsequent targeted attacks of Christians in Baghdad and Mosul. The total death toll at Our Lady of Salvation Church in Baghdad was 70, and 53 of the people killed in the strike were Christians, a minority group in a predominantly Muslim nation. U.N. offices in Syria, Jordan and Lebanon are reporting a growing number of Iraqi Christian arrivals. The U.N. High Commissioner for Refugees said Baghdad and Mosul Christians have been headed to other destinations in Iraq, such as the Kurdish region and the Nineveh Plains, a region in the north with a strong Christian presence. "We have heard many accounts of people fleeing their homes after receiving direct threats. Some were able to take only a few belongings with them," the agency said in a statement. "Churches and NGOs are warning us to expect more people fleeing in the coming weeks." In Syria, since November, about 133 families, or 300 people, have registered with UNHCR, "the majority of whom fled Iraq following the October church attack in Baghdad." In Jordan, the number of registrations of Christians during October and November doubled from the same period last year. In September, 57 Christians had been registered and the figure rose to 98 and 109 in October and November respectively. "One man who is now registered with UNHCR in Jordan narrowly escaped the attack, having left the church minutes before the bombing took place. This refugee had been deported from Europe just days beforehand," the statement said. Because of the recent hostilities, the agency urges "countries to refrain from deporting Iraqis who originate from the most perilous parts of the country." UNHCR said it was "dismayed" that Sweden on Wednesday forcibly returned a group of some 20 Iraqis, five of whom were Christians from Baghdad. "One of the Christian men said he escaped Iraq in 2007 after militiamen directly threatened to kill him. Fearing for his life, he traveled through several countries in the Middle East and Europe before reaching Sweden where he applied for asylum. "He said his claim was rejected three times in 2008 and that his claims were not accepted as he was not considered to have been personally targeted. The others we spoke to said their asylum claims were rejected on the basis of improved security conditions in Iraq." UNHCR said asylum seekers from Baghdad, Diyala, Nineveh, Salaheddin and Kirkuk provinces shouldn't be returned by other countries and should get some form of protection. The agency said that despite Iraq's efforts to protect minority groups and their places of worship and an overall decrease in civilian casualties, these people are "increasingly susceptible to threats and attacks." "Our position reflects the volatile security situation and the still high level of violence, security incidents, and human rights violations taking place in parts of Iraq. UNHCR considers that serious -- including indiscriminate -- threats to life, physical integrity or freedom resulting from violence or events seriously disturbing public order are valid reasons for international protection," the U.N. agency said.